This post will teach you all of the habits you need to implement to become a successful college student. I managed to maintain a 4.0 GPA throughout college (except for first semester freshman year because having fun was my first priority). With that being said, I’m going to share all of the habits of a successful college student. 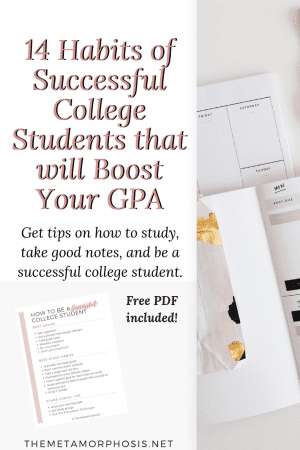 I guarantee you that if you use these strategies you will see a significant increase in your grades and your GPA! *A few affiliate links are used in this post, read my full disclaimer here. I may have procrastinated a great deal but one thing that worked in my favor was that I was always organized. Planners are a great way to map out your assignments and tasks for the semester. I’d advise getting a planner that also has blank pages to take notes of anything. When I used to use planners (I’ll talk about what I use in a sec) I’d map out my assignments even before class started. Professors usually provide the syllabus ahead of time so plan ahead! Look at the assignment due dates in the syllabus and write them down in your planner. Make sure you’re checking your planner consistently so you don’t miss out on assignments and events! 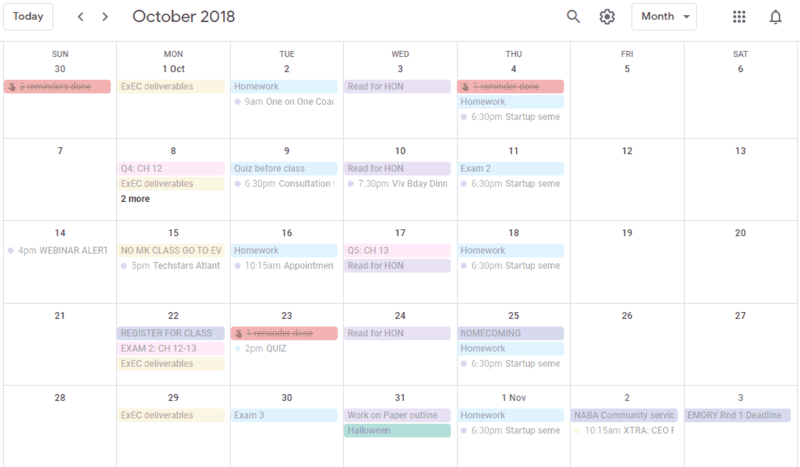 Recently, I made the switch from physical planners to Google calendar for my assignments and events. While I do prefer to write everything else down, I prefer an online calendar because it can send reminders. This is my actual Google calendar for the month of October (with some tweaks of course). I created separate calendars in the settings for each class and assigned a color. I used my syllabus to fill in all the due dates when I got them. What I like about using Google calendar is the reminders part. A physical planner is great but sometimes I would forget to check it or forget it in my dorm which meant missed assignments or inconvenience. However, this is all about personal preference – the choice is yours. 2. Take Good Notes but don’t overdo it! Another habit to adopt if you want to be a successful college student is to take good notes. However, don’t try to write everything down word for word. Develop an effective note-taking strategy that maximizes your note-taking abilities but also allows you to listen in class. a. Review notes already provided. One big mistake I see students making is taking down notes from a powerpoint word for word that is already provided online. Pro tip – don’t. If your professor provides all the notes, the best thing you can do is print them out or have them on your laptop and take note of what they’re saying. If they’re repeating – don’t take notes, but if they’re adding to the information, then you take notes. Just because some people’s notes are extremely neat and organized and look like they belong in a museum – doesn’t mean yours has to be. Now I am not saying to make your notes look like it’s written in greek or be all over the place (unless you understand it better that way). Sometimes my notes are perfectly organized and sometimes I use slang and acronyms because I was trying to keep up with what the professor was saying. But the point is that I understand it either way. Another person may not, but that’s okay because my notes are for me. If you’re more of a visual person then feel free to use diagrams and examples if it helps you understand the notes better. Sometimes I add arrows to certain examples to explain a specific part I think I may not understand when reviewing. Again, organization is key if you want to be a successful college student. If your notes are in 12 different binders and notebooks you’ll definitely have a hard time. I recommend getting a binder like this. Typically, I’ve used the hardcovered ones but next semester I plan on getting this one because it gets the job done and it’s not as bulky. I made the mistake of not dating my notes a few times and it was hell trying to sort through my notes when it accidentally fell out of my binder when I was studying. Don’t make that mistake! Use headings: just do it, trust me. It’ll make your life so much easier. One of the best pieces of advice I can over is to make sure you balance your school life and your social life. If you overwork yourself you’ll eventually burn out like I did. You may also become less productive and start to procrastinate more and develop poor time management skills. It is okay to go out and have fun with your friends. Doing school work 24/7 is unrealistic. Take a break and have some fun so you don’t suffer from FOMO (fear of missing out). When you take a break it recharges you, so when you go back to studying/doing work you don’t feel drained. I can tell you from personal experience that ever since I created that balance I’ve been less stressed. Definitely stressed, but not as much as I would be if I took no breaks. In fact, I even went to the botanical gardens with my friends the night before I had a paper due. Why? Because I was already stressed, burned out, and suffering from writer’s block. There comes a point in time where you know you’re not going to be productive. So rather than wasting time, just take a break. Yes, I finished the paper in time and got an A on it in case you were wondering. I bet you were expecting this one. We’re all guilty of this. One of the worst things you can do is to leave all your work for the last minute. Believe me, I’ve done that many times this semester because of how busy and unmotivated I was and it backfired every time. Use your planner to keep track of deadlines and block out times to work on your assignments. Believe it or not, you have to strategize the way you study if you want to see good results. How many times have you studied for a test for hours but didn’t do as well as you wanted to? How well you do on a test does not directly correlate with how long you study. Rather, it reflects how well you study. Take my word for it. I’ve had a 4.0 GPA ever since my spring semester of freshman year. I’ve talked to many people who said that they spent a lot of time studying for a final/quiz and even read the whole textbook but they still failed! So let’s get into the best study tips for acing your tests and quizzes! P.S. Keep in mind that people learn differently. For example, I’m more of a hands-on and visual learner. You might learn better by reading or listening to a lecture. Tailor these tips to your learning style. 1. Start with the Study Guide! If you only had x amount of hours to study, wouldn’t you want to make sure you covered what’s going to be tested? If your professor provides a study guide, use it. I’m aware that there are some professors who throw in surprises on tests that weren’t in the study guide. (Don’t worry, there’s a special place in hell for them) But if you listen to them carefully, you might be able to figure out if that’s going to happen or not before you’re tested. 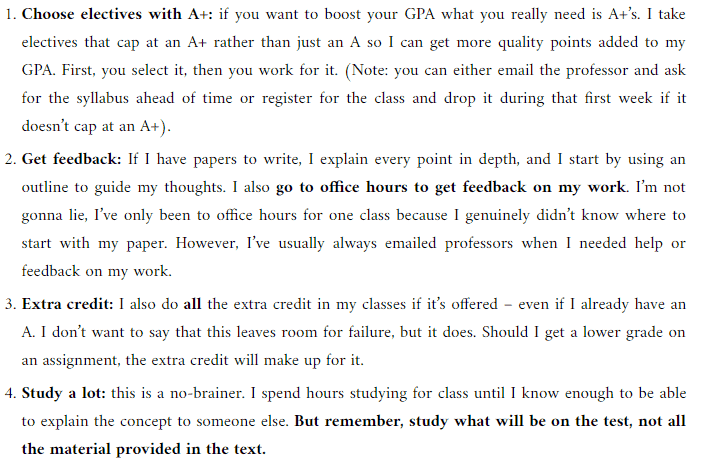 If your professor explicitly says something indicating that only what’s on the study guide is going to be tested; that’s what you study. If they imply that there will be more material, then make sure you go over whatever material you covered in class. Pro tip: professors usually have a systematic way of testing. The first test is always the hardest because you don’t know what to expect. After that, you can predict how future tests will be based on how you were tested the first time. Take advantage of this! But isn’t that being lazy or a bad student? My personal opinion – no. If you love the class and want to learn as much as you can, then go ahead. There’s nothing wrong with wanting to read the entire text. However, I would suggest you do that in your free time or after you take your test. That way you maximize your time studying what’s actually going to be on the test. You can read more about how I use my study guide to prepare for exams in this post. 2. Do NOT read your ENTIRE textbook! Reading your entire textbook or most chapters may do more harm than good! Why? Because unless you’re someone who just really loves to read, you’re going to get burned out. The worst thing about that is you’ll get tired or bored before you even start retaining the information. It’s a great initiative but it might not be the best option. Here’s a better way to do this: use the study guide given and take note of what chapters are covered. Read only those chapters or read on the specific topics outlined in the study guide. You can also read on relating topics in the chapter if it helps you understand better. The main thing to remember is that you’re trying to use your time efficiently. P.S. I’ve never bought a textbook in college! You can learn more about how I did this in this post. This doesn’t have to be anything fancy. Simply test yourself on the topics in your study guide to see what areas you struggle with the most. I always do this when I’m studying so I can know what to focus on. I often think I know some of the material already (because I should know it), but testing yourself sometimes reveals a different story. You can either have one of your friends quiz you on the material, question yourself, or use Quizlet. On Quizlet, you can either create your own practice test or you can search for your course information + chapter to see if someone already has flashcards for that class. Need some more tips for college? OR check out the Ultimate College Guide for tips on how to successfully navigate college! Again, if you’re pressed for time, you should spend the majority covering what you need the most help with. If you’re studying for multiple tests, split your time up so that the subject you struggle with gets more study time. Why waste time studying something you already know, right? Ideally, this goal should be in line with a concept you struggle with. So at the end of your study session, you should be able to demonstrate your understanding of the concept. If you can’t, then you’re not done studying. Get the PDF to post to your bulletin board or wall in your dorm to help you stay productive! This goes hand in hand with the previous goal. It’s not enough to read a paragraph and then tell yourself you understand it. At the end of the chapter/reading, ask yourself what you’ve learned. Then verbally explain the concept you just learned and relate it to other material in the class. This is one of the most effective habits that has helped me maintain my GPA. When I’m studying for my accounting classes, I always do this. When I’m done with a chapter, I verbally explain the concepts out loud (to myself, yes.) and relate them to other chapters. This demonstrates a deeper level of understanding of the material. If you can do this, I guarantee you that you’ll perform better on your exams. I saved this for last because I knew you were expecting it. Nevertheless, it still had to be said. I understand that sometimes things get a little busy and that ends up being your last resort. Believe me, I’ve done that many times. But I always perform worse than I would have had I studied more. To learn what resources I use to help me study +more study tips read the full post. Like I mentioned before, I’m a visual and kinesthetic (hands-on) learner. So I actually look for Youtube videos on the concepts I’m studying from time to time. The best way to retain the information you study is to study based on your learning style! You can determine what style works best for you using this infographic. I’ve been using Grammarly for about 2 years now and it honestly is the biggest lifesaver ever! Grammarly is an online tool for spell checking, grammar checking, and plagiarism detection. I use Grammarly to check every paper, homework assignment, email and even my blog posts before it’s submitted. It automatically highlights any errors as I type. You also have the option to review your text after you’re done in a popup window that will highlight everything from spelling errors to incorrect subject-verb agreement and passive voice. I currently use the paid version to get those extra features but the best part is that you can use Grammarly for FREE! One thing that really ticks off professors and makes you lose points is simple grammar errors. With Grammarly, you can avoid that! Now if you’re anything like me, this is out of the question. However, some people find this useful so I’m including it. Personally, I always study by myself because other people always distract me. If I ever study in a group it’s usually after I’ve already done a lot of individual studying (in case the study group isn’t productive). Like I said this before, this is up to you. I have benefited from study groups before in all the ways described above. However, it tends to be less productive overall (in my experiences), so I prefer to study alone. I recently discovered this technique on Pinterest and I’ve found it to be very efficient. Basically, you work in 25-minute intervals and take short breaks in between. I usually take either 10 to 15 minutes to start and then I increase my break time after a while if I’m really productive. You can learn more about this technique here. It’s pretty easy to start. All you have to do is create a to-do list of a few tasks you want to accomplish and then apply the technique. I use the timer on my iPhone to do this. That’s all for today, folks! But that was a lot of information, right? Why not get the shortened version to keep in handy for when finals come around?